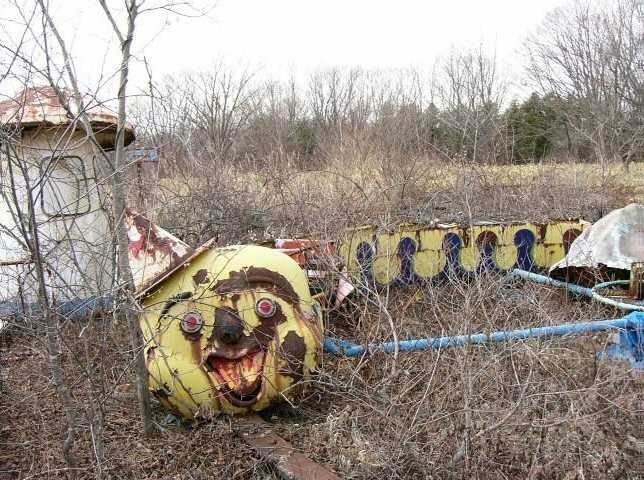 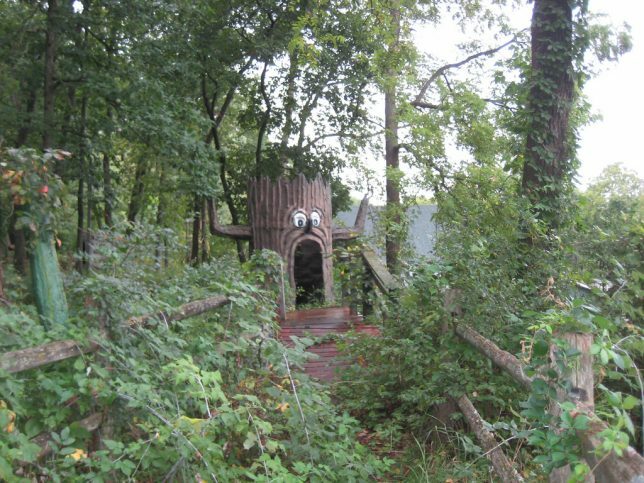 Once delightful domains of sight and sound, these creepy abandoned theme parks now moulder away in silence attended only by shadows and memories. 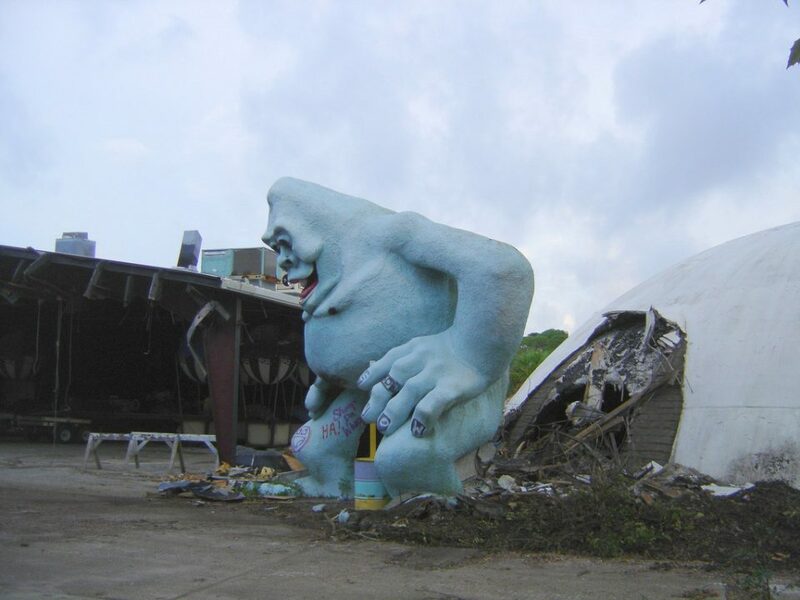 What a dump… er, no, not this charmingly manicured abominable snowman in particular but the entire abandoned Miracle Strip Amusement Park in Panama City Beach, Florida. 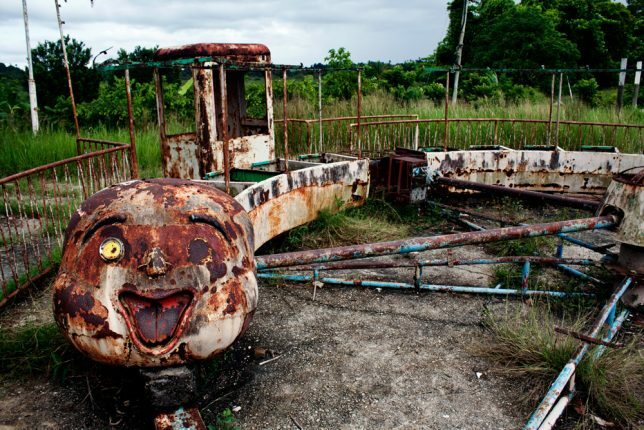 The park closed in 2004 and “enjoyed” a whole half-decade of unhindered deterioration until the site was finally demolished in 2009, as disturbingly documented by Flickr user Steve Sobczuk. 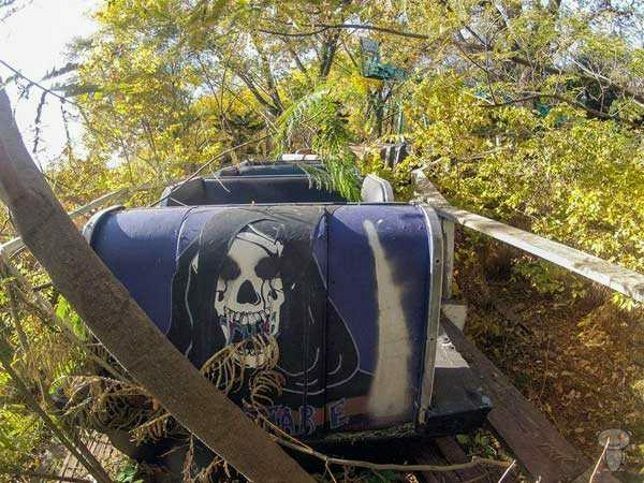 You’ve gotta admit, the Dante’s Inferno ride never looked spookier than it did in its dying days. 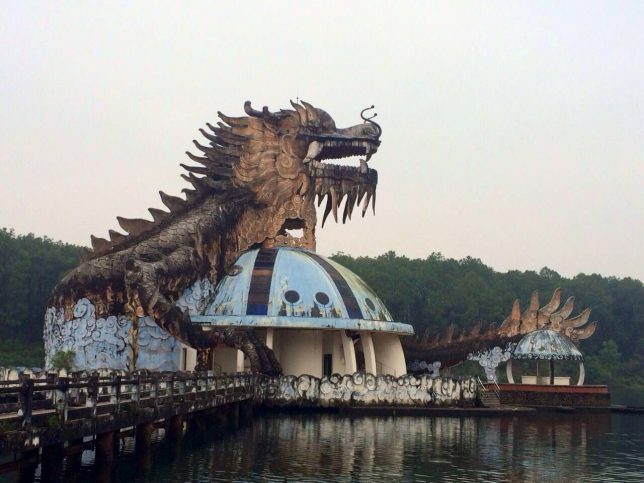 Ho Thuy Tien is an abandoned water park and aquarium located in Huong Thuy, a district of Hue, Vietnam. 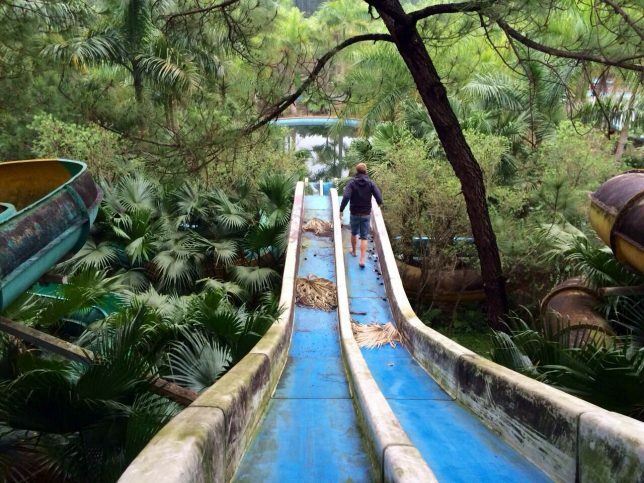 Urbex explorers like Courtney Lambert of A Great Perhaps had best navigate those slimy water slides with care – the park’s aquarium once housed a trio of very hungry crocodiles who were abandoned along with the rest of the park in 2013. 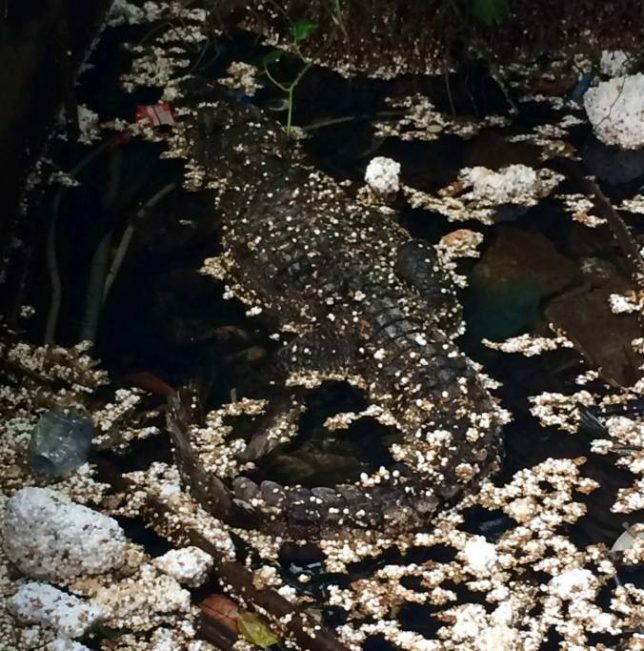 Fear not, animal lovers: thanks to Lambert alerting PETA and the WWF, the crocs were moved to a wildlife park in northern Vietnam. 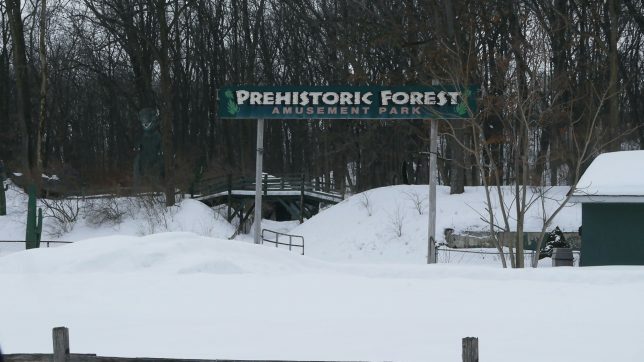 Prehistoric Forest Amusement Park in Michigan’s otherwise pleasant Irish Hills opened in 1963 but by the 1980’s, changing trends in recreation and tourism saw visitors and revenues enter an irreversible slide. 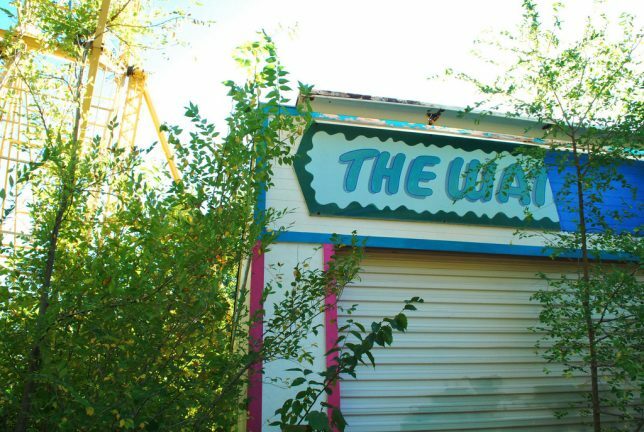 We’d like to say an asteroid gave the struggling tourist trap its death blow but the truth is far less dramatic – the park was sold by its original owners in 1997 and closed for good in 1999. 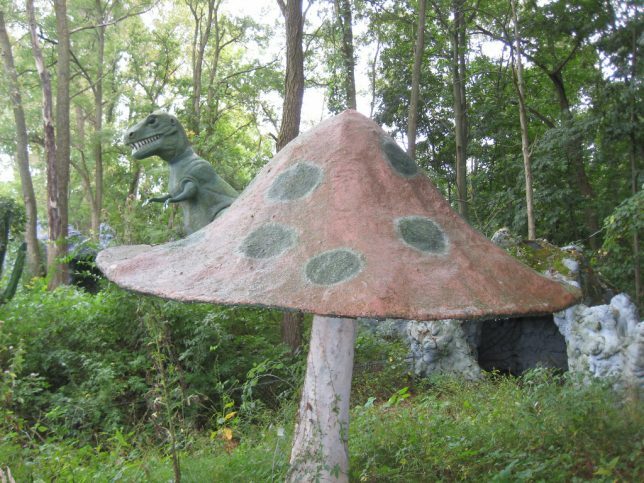 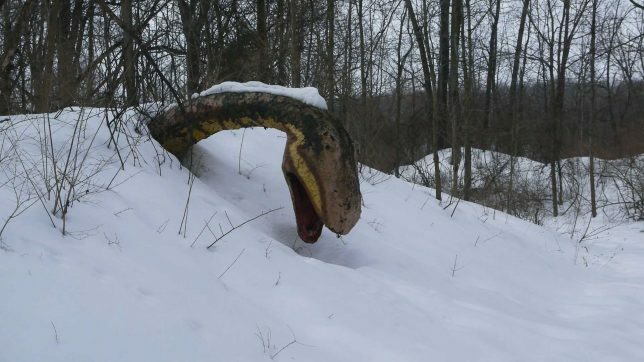 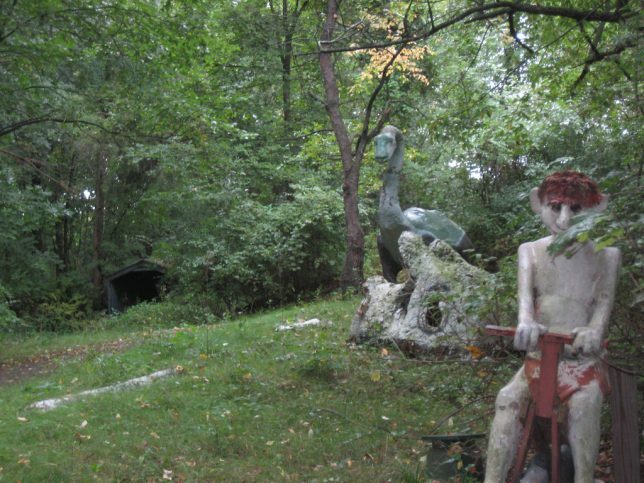 In Prehistoric Forest Amusement Park’s heyday, as many as 70 fiberglass statues of dinosaurs, mammoths and the odd Neanderthal Man (kidnapped by students in 1985 and deposited in front of Saline High School) dotted the park’s forested grounds. 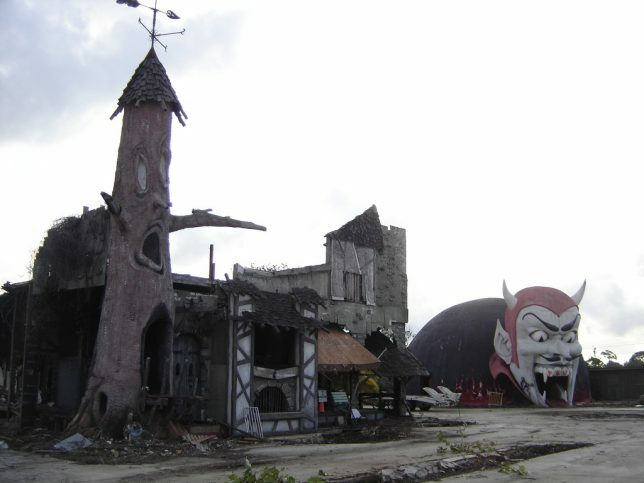 A few still stand today; most have been damaged or destroyed by vandals. 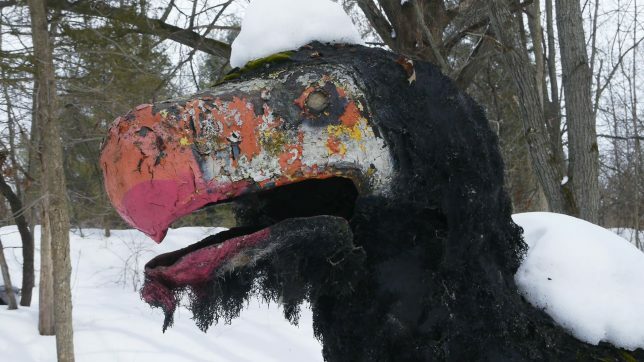 Kudos to KE Photography & Video (whose video of the abandoned park in winter can be viewed here) and Flickr user Wolly Shambler for capturing and posting the images above. 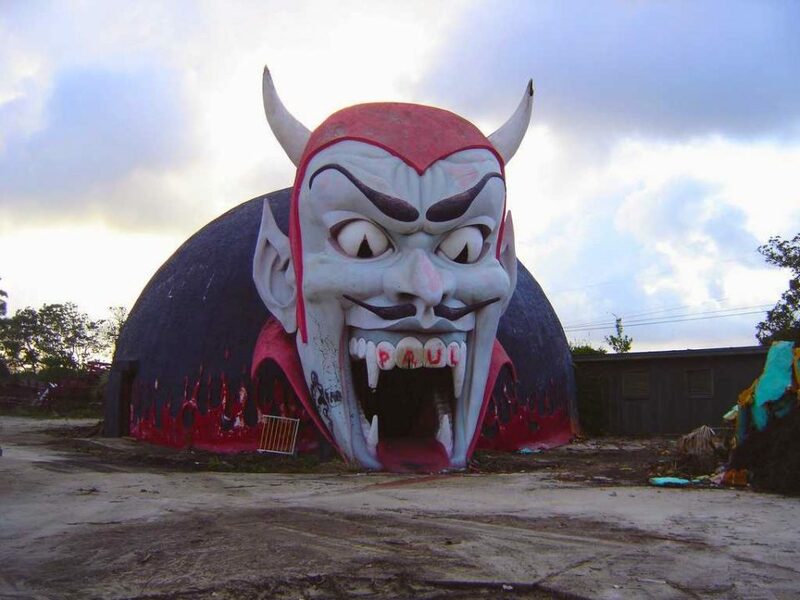 One of six Joylands in the USA, the former Joyland Amusement Park in Wichita, Kansas, operated from June 12th, 1949 through 2004, and then again for a short time under new ownership in 2006. 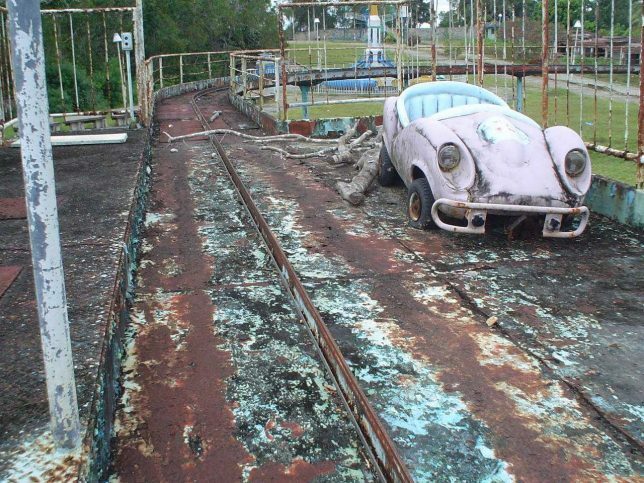 The park suffered extensive vandalism during almost a decade of neglected abandonment, a sad fact reflected in the images above. 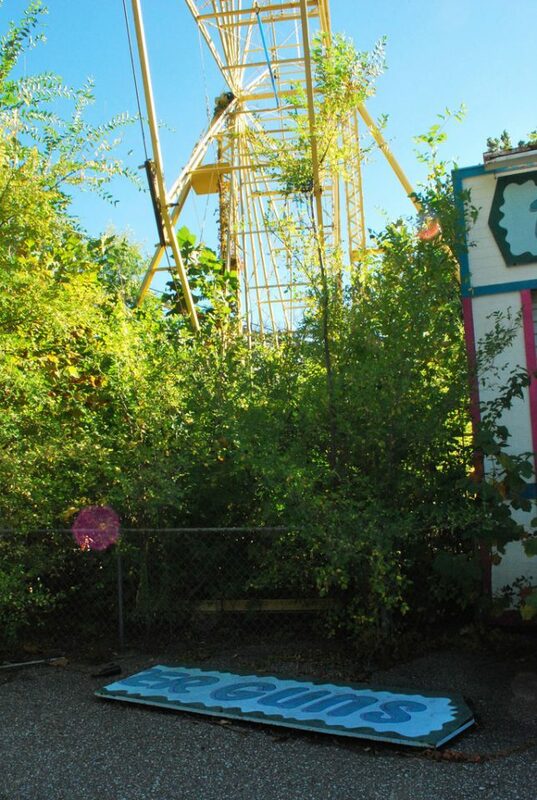 By the summer of 2015, the park’s last remnants (the roller coaster, to be exact) had been dismantled and the site bulldozed flat as the Kansas prairie. 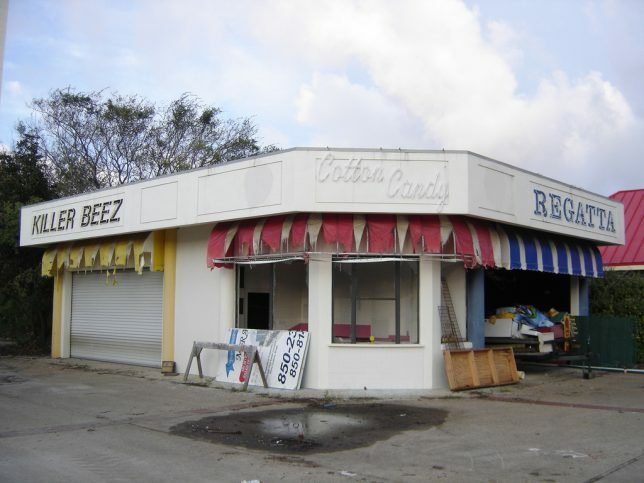 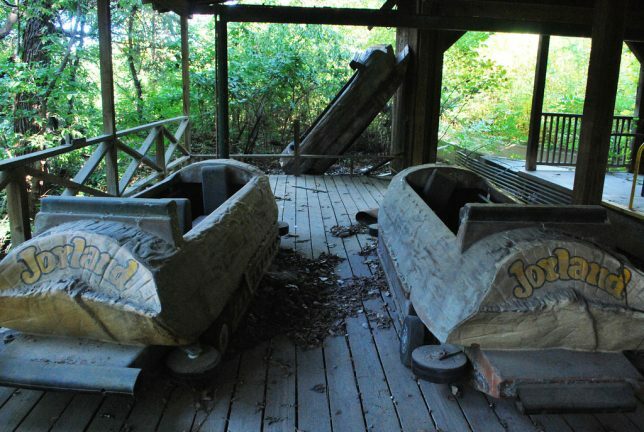 Flickr user Krisi Metzen snapped these scenes of a joyless Joyland in October of 2013.